Manicure – a manicure in our salon is a memorable experience and real treat. Come and have your nails shaped, polished and buffed whilst soaking up the atmosphere, and walk out with perfectly manicured hands that will last and last. Artist painting with design and diamonds included. 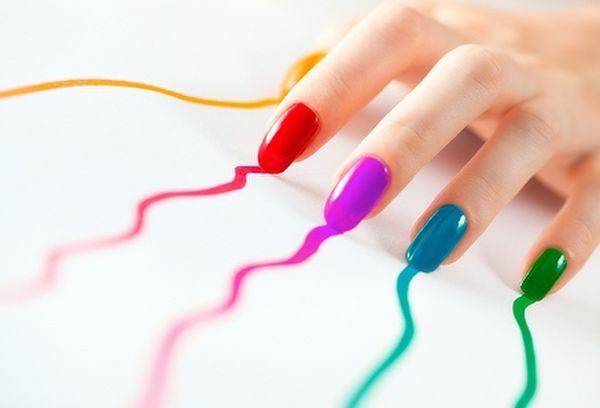 Gel nails – gel nails are a revolutionary light cured UV resin nail system with great flexibility. Unbeatable adhesion and virtually no lifting. The Gel is a supportive overlay to natural nails or nail extensions. By having a high quality Gel Nails system you only need an infill every 4-6 weeks. Gellux – Gellux gel polish is a high gloss, fast drying, hard wearing alternative to nail polish that is chip resistant and last for 2-3 weeks. It can be used on hands or feet and its hard wearing nature makes it ideal for holidays, weddings and everyday wear. Gelux dries under a lamp which means that there is no waiting around for your nails to dry and no risk of accidental smudging. Pedicure – Enjoying a pedicure is not only a way to improve the appearance of the feet and toe nails but it is a deeply relaxing experience. Pedicures are designed to work on the whole foot starting with shaping the nails, tidying up the cuticles, exfoliation, removal of hard skin and a relaxing foot and leg massage. All pedicures include a varnish at the end. Artist painting with design and diamonds included. Toes Gel – Gel formula on toes, finished with either a classic French or a coloured gel. Fantastic for summer or holidays as the treatment can last up to 8 weeks. Toes Paint – A shaping of the toe nails and a choice of one of fantastic colours to finish. Last up to 6 weeks. Artist painting with design and diamonds included. Gellux Toes – ‘Performs like a gel, applies like a polish’ The gels are applied like a polish but are cured underneath a uv lamp. Gellux stays on for 3 weeks with no chipping and peeling and soak compltely off in 15mins. Fantastic if clients want a one off set for holiday as these are easy to remove and there will be no damage at all to the natural nails.